Within the framework of extension of the metro line 5 in São Paulo by Companhia do Metropolitano de São Paulo a modernisation of platforms was forced. 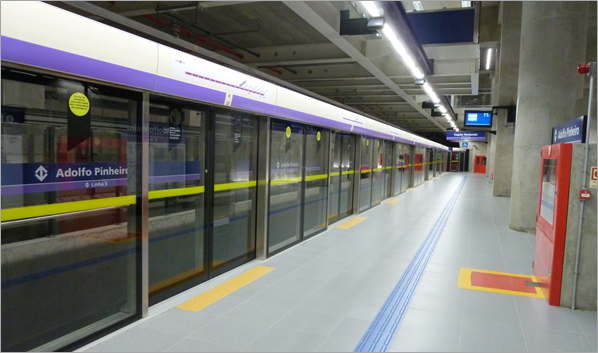 The station Adolfo Pinheiro is upgraded with platform screen doors. This will prevent passengers from falling on the track area. There are functional safety requirements for the communication between the train and the platform screen doors. The system supplier of the platform screen doors was attended and consulted by us in process for the proof of safety according to European standard EN 50126-1. After finishing accompanying verification tasks the independent system safety assessment was issued by Prof. Dr.-Ing. Jochen Trinckauf. Additionally, a proof of safety for an independent system for the train position detection, which was developed by the system supplier, was attended and supported, too. The system safety assessment on the whole process of development of this system was realised by the independent expert as well.